Why does everyone complain when Facebook gets a new design? As soon as the changes appear, people start moaning. It’s happening right now, as the redesigned News Feed is being rolled out to all users, after almost a year of fine tuning. But why does everyone get so grumpy? Humans are change averse when it comes to graphical user interfaces, among many other things. Knowing your way around a website or software is a matter of habit. When it changes, you lose your points of reference and have to learn your way around again. That leaves you dumbfounded until you new habits are formed over the old ones, which can be a bit of an annoyance. 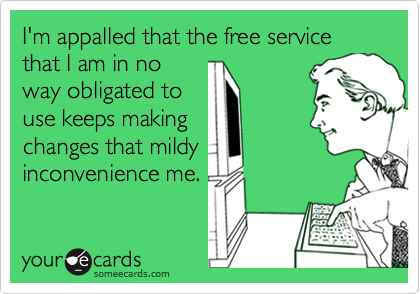 In other words, changes in Facebook make you feel stupid for a little while, and you hate that. Change is difficult. Moving to a new city, starting a new job or learning how to use an operating system are all processes that require you to think about every little thing you’re doing. It’s hard work, but it’s something we generally accept, if maybe ungraciously, as a part of life. When change completely eludes our control, though, we feel lost. How would you react if you got home tonight to a completely rearranged furniture layout in your house? Change can be good and exciting, depending on your personality, but it’s a form of loss, and we are all loss averse by nature. If I gave you a $50 bill and asked if you want to gamble it on a coin toss for double or nothing, you’d probably do what most people do and choose to keep your $50. We tend to value what we already have about twice as much as potential gains, so the gamble is not worth the risk. Computers haven’t been around that long in absolute terms, so we haven’t yet developed a specific set of psychological tools to apply to changes in that area, and we follow the general rule. Some folks feel that they have a right to retain the interface design they like best (the one they have gotten used to) and claim it’s intolerable that they are not given this option. They even make petitions that go nowhere and are soon forgotten. But Facebook isn’t a product you own or a software you’ve bought. It’s a free service that wants to make money off you and the user interface design is an integral part of its marketing effort, not a matter of anyone’s taste. Companies that pay Facebook to display their ads want to know how they will look like and demand consistency. As Mark Zuckerberg famously said, «you are the product». People have a right to complain all they want. It’s a way to cope with the anxiety brought on by change. But it’s an empty effort when it comes to Facebook. As soon as you readjust to the new layout, a new habit forms and all is well. So, when you feel like you want to kick up a fuss, just wait a week. By then, it’s likely you’ll no longer care.